The subject today is the first page of the probate record for John Metcalf (1622-1690) of Medfield, Mass. tions march the 24^th 1691.
it being onwards our Severall portion. To toul'ills 8d apiece and pillow beers 2s apiece. I say owned by me. 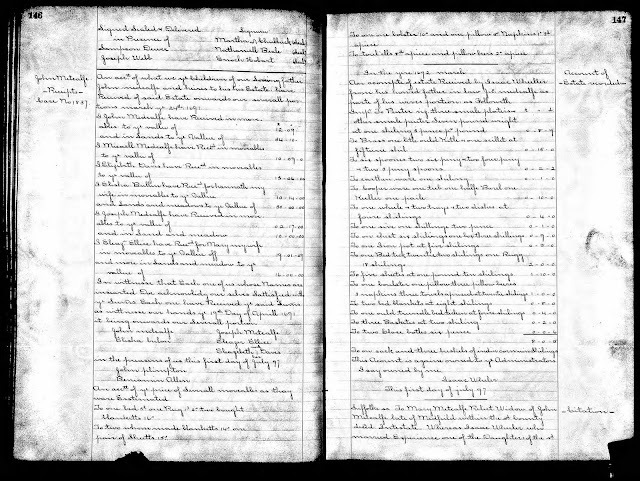 Massachusetts, Wills and Probate Records, 1635-1991, indexed database with digital images,Ancestry.com (http://www.ancestry.com), citing Suffolk County [Mass.] Probate Records, 1636-1899, "Probate Records, Vol. 1-2, 1636-1776," Volume 2, pages 146-152 (images 395-398), John Metcalfe of Medfield Estate, 1691. John Metcalf (1622-1690) died intestate in Medfield, Massachusetts, which was then part of Suffolk county in the Massachusetts Bay Colony. 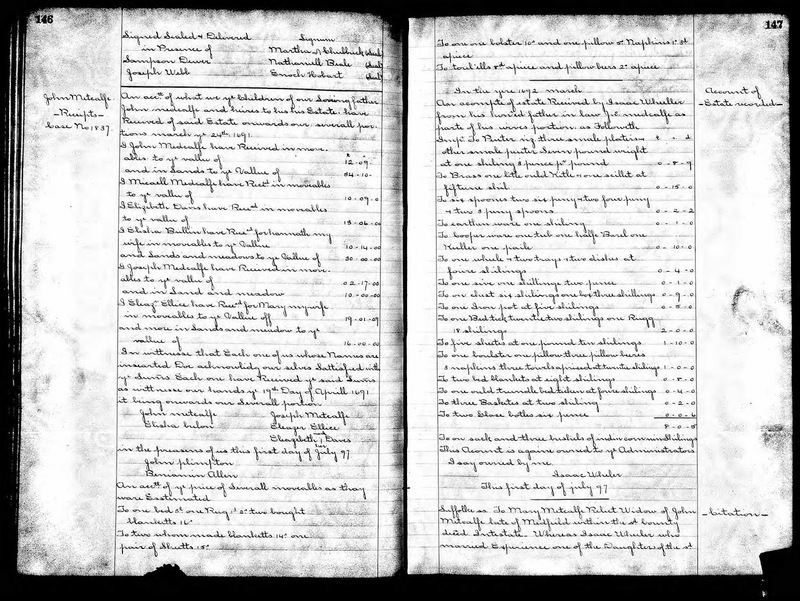 His estate file in the Suffolk county probate records is 7 pages, containing an account, a summons to the widow, the widow's declining administration, and two bond statements. The values of the real and personal property already provided by John Metcalf before his death will be important when the estate was divided. John Metcalf (1622-1690) and his wife, Mary (Chickering) Metcalf (1628-1698) are my 9th great-grandparents. I descend through their son, Michael Metcalf (1650-1691), who married Elizabeth Bowers (1654-1724).